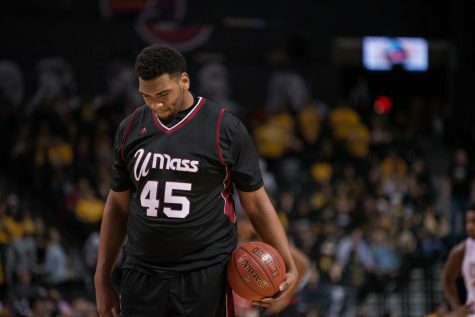 Zach Coleman officially introduced himself to his teammates, Massachusetts men’s basketball fans and the Atlantic 10 Conference on Jan. 17. Those who know Coleman weren’t surprised to see him explode for 13 crucial points in a comeback victory over Rhode Island. Neither was Coleman, who patiently bided his time to make a significant impact for the Minutemen. But the 5,273 fans in attendance? They were surprised. Coleman first nailed a 3-pointer to cut the URI lead to 53-50 with five minutes, 34 seconds remaining. 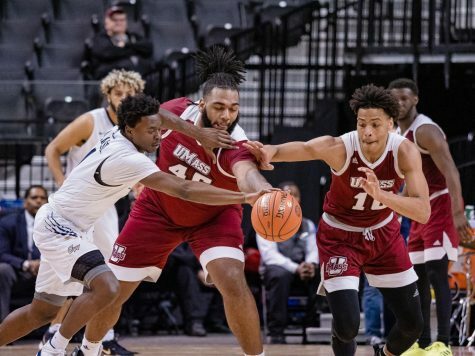 The next possession, he forced a steal and missed a breakaway dunk only to end up with an open 3-pointer from the wing which he made to draw UMass even at 53-53. The Mullins Center roared in approval. It was a rousing hello from the redshirt freshman. 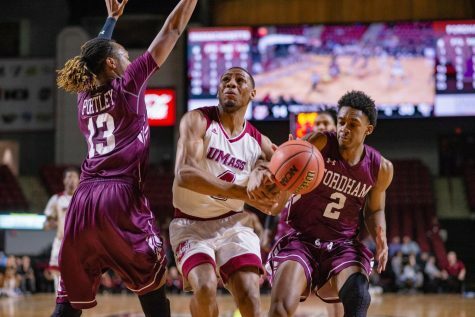 Coleman added a fadeaway jump shot to narrowly beat a shot clock violation to push the UMass lead to 57-53 in what is, to date, his best collegiate performance. It came as such a surprise, Rams coach Danny Hurley simply referred to Coleman as “a freshman” in the postgame press conference. 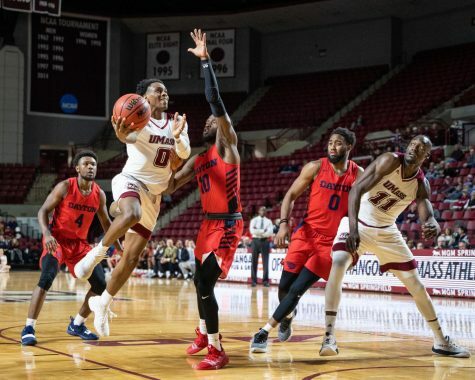 But those closest to Coleman – such as UMass guard Trey Davis, who assisted on his last three shots – are the first to say it’s been a long time coming. If anyone knows Coleman’s game, it’s Davis, who Coleman affectionately refers to as like a family member. “To see Zach out there do what he did was really big for the team to let us know that he’s here,” Davis said. Davis and Coleman often work on those plays together in practice. But their chemistry runs much deeper than a handful of two-hour practice sessions. No one knows them better than their high school coach Pat Washington, who still talks to both regularly. 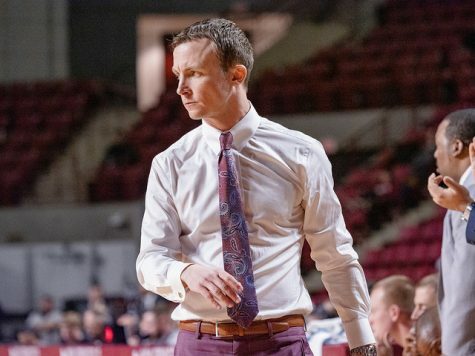 His relationship with UMass coach Derek Kellogg, which stemmed from an earlier relationship via a recruit, helped bridge Davis and Coleman to UMass – albeit in unconventional manners. It allowed the pair to continue to play together and continue to develop a bond which formed around basketball. In the case of Davis and Coleman, they’re practically family. “Kids know each other from the time they walk out of the crib,” Washington said. Davis would never let Coleman drive to school. According to Davis, Coleman, who is two years younger, would catch a ride with him every day to Woodrow Wilson High School in Dallas, Texas, where both were students. Davis said Coleman would try and negotiate his way into the driver’s seat. “He used to try and drive but I was like nah, nah, nah,” Davis said. The pair would get breakfast on the way – preferably donuts – and go straight to school. They’d eat lunch and often play basketball together and then go home. Davis said he spent most of the day with Coleman in school. Trey Davis takes a shot as Zach Coleman (furthest to the left) looks on. Coleman, who at 6-foot-7 is seven inches taller than Davis, often followed Davis’ path as they grew up. “Zach, believe it or not, was smaller than Trey at one point,” said Curtis Davis, Trey’s father. Davis met Coleman in the third grade, when the two would go through drills together at a local church and played together at local recreational centers. Davis was already two years into his tenure at Woodrow Wilson when Coleman decided to join him. They reunited. “When Zach knew Trey was here, he said, ‘Hey, maybe it’s a good place for me,” Washington said. Davis was already impressing Washington when Coleman arrived. “Trey Davis is one of the toughest jokers I’ve ever coached,” Washington said. The prospects of adding Coleman to the mix – Woodrow Wilson is one of the strongest programs in the area – was tantalizing. But Coleman and Davis never got a chance to fully play together. Coleman didn’t play during his freshman year (Davis’ junior season) and he missed his entire sophomore season after tearing his ACL in his left knee. So they made a name for themselves in a less conventional manner. Is Davis a pickup basketball legend? Well, it depends on who you’re asking. Upon hearing the question, his mother, Melissa Davis, chuckled and rolled her eyes in a way only a mother could. His father at least gave the idea some credence, referring to his son as a “big time” pickup player. Davis initially agreed. “Yeah,” he said, a grin slowly forming. His trademark confidence quickly followed. Davis may have been a legend on his own. But combined with Coleman? Well, the Dallas pickup basketball circuit had issues on its hands. According to Davis, they’d play with other Division I players such as LeBryan Nash (Oklahoma State), Keaton Miles (Arkansas) and Thomas Gipson (Kansas State). On occasion, college coaches would watch. What they saw was Davis, an undersized and fearless scorer and Coleman, a skilled big with high basketball IQ. One instance formed the idea of both Coleman and Davis playing college basketball together. Around that time, Kellogg was looking for a point guard at UMass. Kellogg knew Washington from his time as an assistant coach at Memphis under John Calipari. He recruited Woodrow Wilson product Anthony Randolph – who instead chose LSU and was later selected in the first round of the NBA Draft. But Kellogg and Washington stayed in touch and it was Washington who directed Kellogg toward Davis. 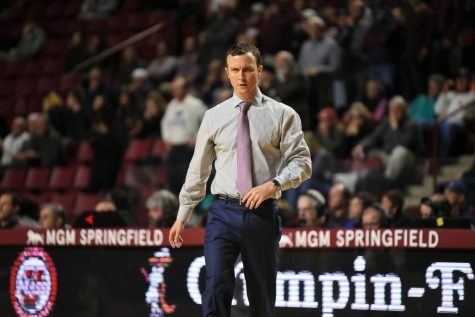 Davis initially committed to Atlantic 10 rival George Washington, but requested a release from his scholarship when the Colonials made a coaching change. Kellogg said he spoke with Washington, who thought Davis would be a good fit. Davis agreed and after spending a year playing at two different prep schools, arrived in Amherst. Now it was time to sway Coleman. Coleman initially committed to Missouri, but Davis was undeterred. 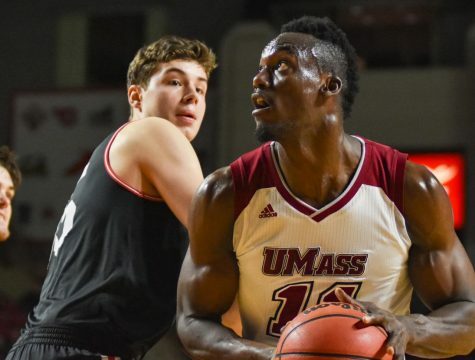 After months of his friends’ UMass recruiting pitch, he succumbed. “Just seeing how the school was and the program and the style of play, and also he was here, it was a no-brainer that I was going to come here,” Coleman said. Coleman committed to UMass and the plan was set. At last, both had decided on a school. And while UMass wasn’t the first choice – it turned out to be the best one. The Minutemen knew they had a point guard who could score in bunches and a skilled forward capable of playing multiple positions. But what wasn’t on the scouting report was Davis and Coleman’s ability to hone in on a practical joke. Washington fell victim to their jokes firsthand. He was traveling with the pair earlier this season to watch UMass face LSU. When Washington went through security metal detectors at the airport, Davis and Coleman hatched a plan. Davis schemed to hide Washington’s shoes as they passed through the detectors. Coleman would stand lookout, hoping Washington wouldn’t catch on. They almost got away with it too, but Washington caught him out of the corner of his eye at the last moment. According to Washington, it wasn’t Davis’ first time trying to pull off a trick. Of course, Davis also remembers Washington getting the upper hand. One time, Davis and a teammate thought they’d skip out on running with the rest of the team. They returned to their lockers to find them stuffed with basketballs. Washington instead provided them makeshift lockers in a storage closet. It’s something they can all laugh about now. According to Washington, their sense of humors haven’t changed as they’ve grown up. But he certainly wasn’t going to give up an opportunity to sneak a joke in at their expense, either. “I’m going to say this,” Washington said. “I’m giving a big shout out to (UMass strength trainer) Rich Hogans. Because Zach and Trey had some of the raggediest bodies I’ve ever seen when they left. 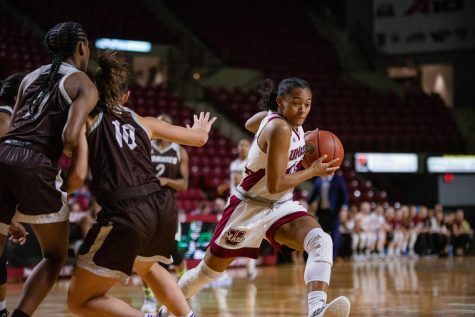 Following games, UMass produces a video highlight of important plays from the previous game to play in the locker room for the team called “Specials.” Prior to the Rhode Island game, none of Coleman’s plays ever made the final cut. “Zach’s always like, ‘Man, I can’t wait for my plays to be on Specials,’” Davis said. Coleman laughed when he heard Davis’ comments and admitted it was a good feeling to finally earn recognition from game experience. Coleman’s seen Davis’ plays make the highlight reel before and, after spending nearly 18 months on campus, could finally say the same, much to the excitement of Davis. As the season progresses, the pair should have more opportunities to showcase their bond. Davis is averaging 10.7 points per game in 31 minutes per game while Coleman continues to see an increase in playing time and is averaging 11.2 minutes per game. It’s just another area for the pair to be seen together. They live together off campus and always lead UMass’ pregame layup lines. 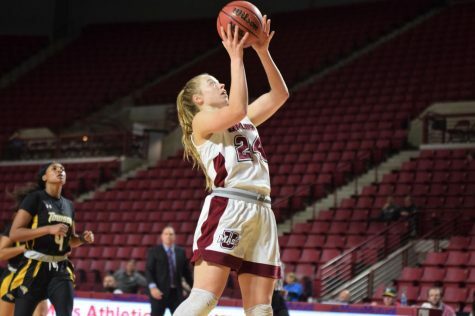 The relationship’s foundation is rooted in Texas and if plans worked out initially, there’s a chance neither would be at UMass. But to those around them, everything’s worked out perfectly. 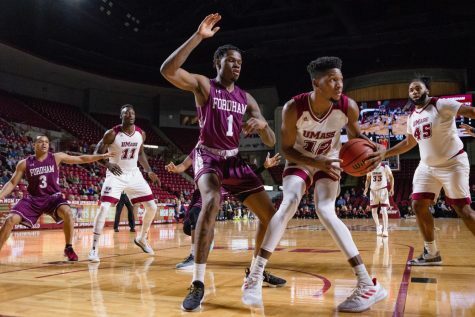 The Minutemen often preach a family atmosphere centered around a “brotherhood.” Davis and Coleman may offer UMass’ strongest example. “We do everything together,” said Davis of his relationship with Coleman, who doubles as his roommate at school. Beautiful article! Big Ups to my son Zach, and my nephew, Trey! “I’m I my Brothers keeper…YES, I AM!! Good story by a good writer about good kids. Great Job Zach keep on working hard. May God continue to have favor on your life.